Ever since I bought liquid smoke from here , I have been obsessed with making thick, rich barbecue sauce. The kind you can eat with a spoon. I got one from the Deen brothers, offspring of one of my ultimate cooking heroes, Paula Deen, and oh my Ford, it is unbelievably good! So for my friend Miss Yesmin’s barbecue, where she’s hosting some super-cool veggie heads like me, I present to you the dish that will make non-tofu eaters LOVE it. Even if it’s just for one night. I should know, I’m one of them. The tofu HAS to be Pureland… everything else tastes… um… not as good. 1. Chop your tofu in half widthways, so you have two even-sized squares. then chop these into five long strips, which you then cube. Don’t make them too big, or they won’t soak up the marinade properly. For even better soaking qualities, place the tofu on a plate, and put a second plate on top with something heavy on it to squeeze all the water out. Leave for about an hour, and drain. 2. Put the tofu in a shallow dish with the onion, orange juice and garlic. Cover and marinate for at least an hour. 3. Combine the rest of the ingredients in a bowl. 4. 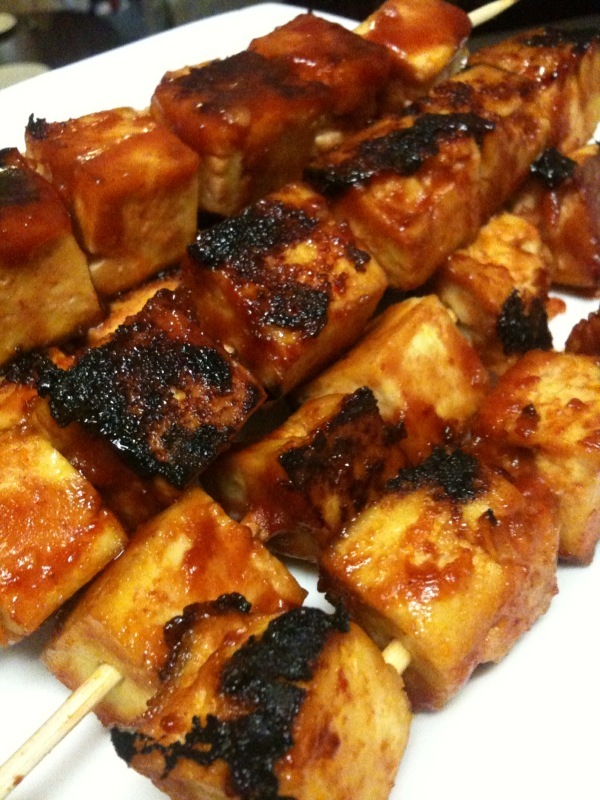 Thread your marinated tofu onto skewers, and place in one layer on a plate. Pour half the barbecue sauce over, and turn to cover thoroughly. 5. 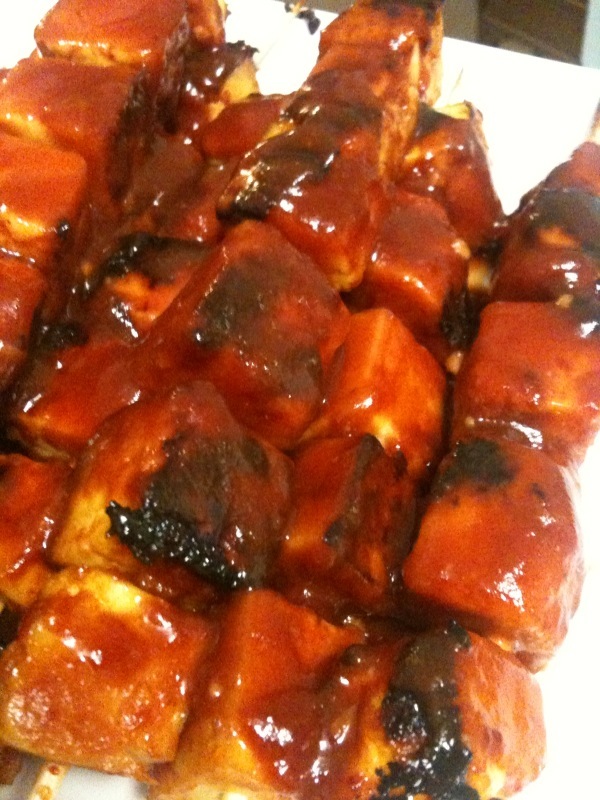 Cook on preheated barbecue, turning every now and then until the sauce caramelises on the outside. Keep basting with the marinade every time you turn them. Don’t be shy, now! 6. When the kebabs are done, pour the rest of the sauce over and get busy eating! 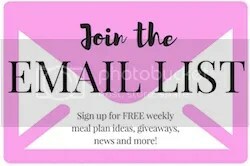 Wow!I cant wait to try this!Your recipes are amazing!I'd love to guide our readers to your site if you won't mind.Just add your choice of foodista widget to the end of this post and it's all set, Thanks! I would eat those in a second! Liquid smoke- now I have to try this, very cool! Hiya, been a vegetarian since (dare I admit it?) 1989. Yikes that makes me old lol… Love your cooking, will keep an eye on it and try some myself!